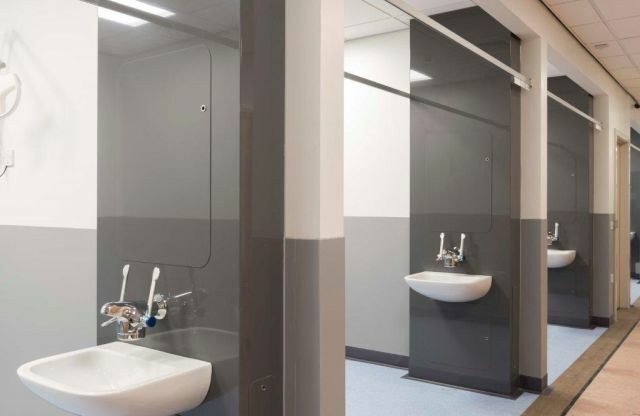 Designed to encapsulate the pipework, BioPod® is an aesthetically pleasing, hygienic finish to a common trade problem. Pre-fabricated with no joints, it comes complete with access panels, basin and tap, and is wrapped in BioClad® antimicrobial wall cladding. The product is designed to offer a joint free, fully accessible, ultra-hygienic unit, that is easy to install, but even easier to maintain. It is delivered pre-plumbed, reducing the installation period. The simple install procedure allows the reduction of the amount of trades required, saving time and money. Wrapped in BioClad® antimicrobial PVC, it offers an unrivalled protection against bacterial growth. The plinth detail allows a neat, hygienic sealed joint to the vinyl floor. Compatible with UK HTM Regulations. It comes in a standard size and specification, however, it can be built to a bespoke specification. It is not even limited to a wash station; showers, sluice units or WC basins are also available in a wide selection of colours. In addition, the product can be built to conform to anti-ligature specifications. Joint free shell - easy to clean with no additional areas for bacteria or germs to colonize. Wrapped in BioClad® PVC - proven to reduce bacteria by up to 99.9% within two hours; ideal for areas where hygiene is of paramount importance. Available in a range of bespoke colours. 750 x 225 mm. Manufactured to suit ceiling of maximum height 3000 mm. 120 x 743 x 220 mm (to receive coved vinyl flooring, including vinyl flooring).